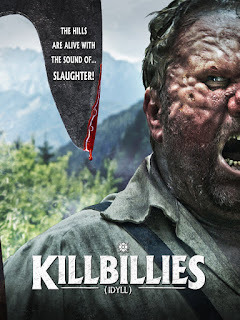 A rare Slovenian horror film, this offers yet another replay of the highly familiar backwoods splatter movie scenario American horror has been awash with since DELIVERANCE. A pair of fashion models go back to nature for a mountain-set photo shoot, and aren’t overly deterred by the creepy accordion-playing geezer and cackling jam / liquor – selling gypsy witch they meet along the way. Two sub-WRONG TURN disfigured hillbillies, when they’re not insulting each other, soon have them strapped to tables for sundry pleasantries. Unfolding in daylight against a beautiful backdrop, this is mostly one note and derivative, though the silly villains are amusing (“Now you’re going to get it, you old whore!”), the old-school gore is nifty and the fashionably cynical ending has an unpleasant fate for the heroine before a very long closing shot that seems to be bidding to be the rural horror equivalent to the last moments of THE LONG GOOD FRIDAY.